Fusion PDF Image Extractor is a free pdf tool for Windows that is used to extract images from pdf file as well as allow you to convert single page or multipage pdf files to jpg images. Hence it is providing two features which you won’t find in most of the similar pdf tools. You can extract all images present in a pdf file in jpg form, can convert a pdf file into jpg image, or can perform both the functions. Extracting images from a pdf file is helpful in case you don’t want to convert pdf files into jpg images. In that case, you can use this handy tool. Moreover, if you have need to convert your pdf files, then also you can use this tool. Fusion PDF Image Extractor is quite useful tool which anyone can use without any trouble. But its shortcoming is that it is limited to extracting images in jpg format only. Below screenshot shows the interface of Fusion PDF Image Extractor which is quite simple. There are only three steps you need to perform to extract images from pdf or to convert pdf files to jpg. Simply provide a source folder (containing your pdf file) and a destination folder of your choice in which images will be extracted. After this, hit the Extract Images tab and immediately it will extract all the images which you can find at the destination location. It is a simple process to extract images from pdf file. 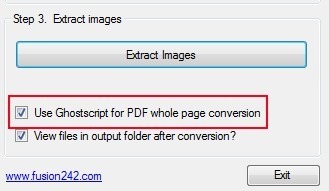 Other than this, if you want to convert whole pdf file (single page or multipage), then enable Ghostscript option by clicking on its check box as visible in below screenshot. After this, hit the same Extract Images tab to start the conversion. It will start loading all pdf pages in a separate window and will convert all the pages to jpg. 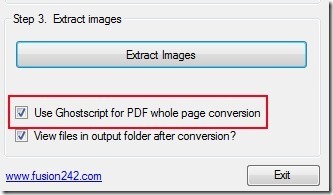 Here, conversion process can take a bit of time as all pdf pages will be converted to jpg form. Once after converting all the pages, you will find them as jpg images at destination location. A useful tool that helps to extract images from pdf files in jpg form. You can also use it as a pdf to jpg converter. Easy to use tool with simple interface. It is an open source software. Available free of cost. You can find its download link below in this article. Its zip file is less than 12 mb so it won’t take much time to download. Once after downloading it, extract its zip file and run setup of this tool. Follow the simple installation steps and complete the installation process. After this, you can run it immediately or later using its desktop shortcut. 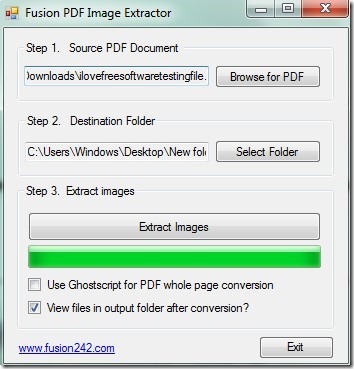 Get Fusion PDF Image Extractor free. We have also reviewed gttext and PDF Text Extractor that can extract text from pdf files.